This is the top A-series camera. It was developed alongside the SMC-A lenses, and takes full advantage of their new features: Tv and P operating modes as well as program flash. Also, like the LX, the superA and SUPER PROGRAM offer TTL flash operation, Av, M, and B operating modes. Further, this small and light camera offers solid, mostly metal construction, DOF preview, self-timer, a good electronic shutter, etc. The finder is suitable for eye-glass wearers, and uses two LCDs for displaying the needed information. LCD illumination is also available. The camera accepts an optional winder or a motor drive as well as a variety of other accessories. The compact and beautyful design of the ME Super is carefully developed further. The most obvious changes are the redesign od the prism housing, and the addition of a – removable! – little grip. On the negative side, since the camera is not really intended for “professional use,” it is fully dependant on battery power. 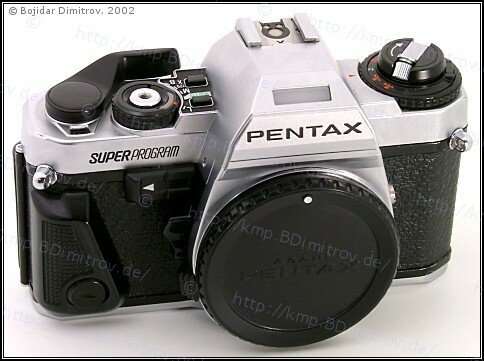 Screens were changeable by the Pentax service, only. There is no exposure lock and no MLU. The working aperture is visible in the viewfinder in the Tv and P operating modes, only. Finally, the X-synch is listed as 1/125 in the specs but it is only 1/90 in reality. 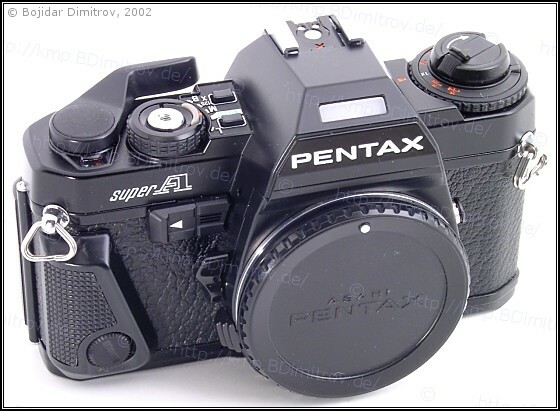 The silver-black SUPER PROGRAM was targeted at the American market, while the black super A was available in the other markets and won the “European Camera of the Year 1983” award. Opening different copies of the camera reveales that at some time Pentax made a complete revison of the camera electronics (not visible from outside) The camera is plentiful on the second-hand market and usually costs around US $60 (in 2014). Today, the superA and SUPER PROGRAM still are attractive SLR cameras, as they are reliable, easy to use, and they even work with all “digital” DFA series lenses and with some DA series lenses (in P and Tv mode and with manual focus, only).